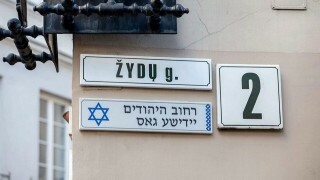 On Žydų (Jewish) st. in Vilnius, there was unveiled a bilingual, actually three-lingual street plaque. A Mayor of Vilnius Remigijus Šimašius and a chairman of the Association of Lithuanian Jews Faina Kukliansky reveiled a street plaque with a street name in Hebrew and Yiddish situated just under a Lithuanian street plaque. “Jewish street is mentioned in historical sources from 1592. It is a glorious history of many centuries. It is necessary to remember, that in the first half of the 20th century, Vilnius predominantly was a Jewish city. Jews made about 40% of the entire society. There operated about 110 synagogues and houses of faith. Jews used to say: If you want to earn money – go to Łódź, if you look for wisdom – go to Vilnius. I suppose, that we should preserve it. Surely, it is good to have money, but wisdom and friendship is, what we all can afford” – said Mayor of Vilnius Remigijus Šimašius. He stressed, that the name of Jewish street was written down, not only in Hebrew but also in Yiddish- a language used by Jews from Vilnius. A Chairman of Association of Lithuanian Jews Faina Kukliansky pointed that the street plaque was unveiled a few days before an important for Jews anniversary –September, 23th when falls Extermination Memorial Day in Lithuania. “This event is to remind, that Jews were living in Vilnius, but it is also a reference to the present day”- said a Chairman of the ceremony an Israel’s ambassador to Lithuania Amir Maimon. A performance of Jewish song and dance group “Fajerlech” added splendour to the ceremony. First Jews settled in the suburbs of Vilnius under the reign of Duke Witold, at the turn of 14th and 15th century. In the interwar Vilnius, a numerous Jewish society had over 100 synagogues, chains of public schools and lower secondary schools, which led classes in Yiddish. Also Hebrew was taught. In 1925 was created a YIVO Institute for Jewish Research. Jews had their own sport clubs and pitches in Krupnicza st. At Pohulanka st. 18, there was a Jewish community centre, and an Association of Jewish Writers and Journalists. The majority of Vilnius’ Jews handled with craftsmanship and small trade. They lived in a compact society between Zawalna, Wielka and Trocka streets. Žydų st, is situated in the pre-war Jewish district, and during German occupation – there was a Jewish ghetto. The creation of a ghetto was officially announced on September 6, 1941. It was situated in, so called, Jewish district, in the West of a town hall, surrounded by Wielka, Niemiecka and Dominikańska streets. The final liquidation of the ghetto was on September 23-24, 1943 – the majority of Vilnius’ Jews were shot in Ponary. Nowadays in Vilnius, there are already street plaques in Icelandic, English, Russian, Polish and Tatar. Stylized, bilingual were hanged in these streets: Islandijos (Icelandic), Rusų (Russian), Varšuvos (Warsaw), Totorių (Tatar) and on Vašingtono (Washington) square. On November, 3th it is going to be held a celebration to unveil one more street plaque –on Vokiečių (German) st. Meanwhile, a government representative in Vilnius region demanded to remove these plaques, because she claims, that setting of these plaques in non-Lithuanian language breaks legal acts, which say that public writings in Lithuania should be in a national language.